Pumpkin is Actually Full of Nutrients! So…what’s so great about pumpkin? The flesh is packed with beta-carotene, the powerful antioxidant that is responsible for giving orange vegetables and fruits their vibrant color and which is converted to vitamin A in the body. Consuming beta-carotene has been shown to aid in immunity, cancer prevention, heart health, blood pressure and vision! 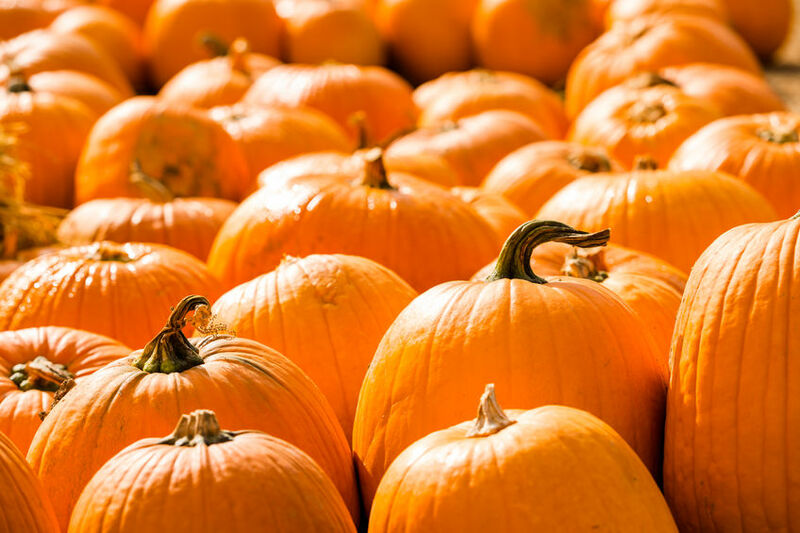 According to the USDA National Nutrient database, one cup of pumpkin, cooked, boiled, drained, without salt contains 49 calories, 1.76 grams of protein, 0.17 grams of fat, 0 grams of cholesterol and 12 grams of carbohydrate (including 2.7 grams of fiber and 5.1 grams of sugar). Consuming one cup of cooked, canned pumpkin would provide well over 100% of your daily needs for vitamin A, 20% of the daily value for vitamin C, 10% or more for vitamin E, riboflavin, potassium, copper and manganese at least 5% for thiamin, B-6, folate, pantothenic acid, niacin, iron, magnesium, and phosphorus. Instead of tossing the seeds or the pumpkin flesh after carving…eat them! Using fresh pumpkin and preparing it yourself will give you the most health benefits, but if you’re limited on time, canned pumpkin is a healthy option as well. Be sure to steer clear of canned pumpkin pie mix, which is usually right next to the canned pumpkin in grocery stores and in a similar can but has added sugars, syrups, etc. Canned pumpkin should have only one ingredient: pumpkin. The seeds of a pumpkin are loaded with phosphorus, magnesium, manganese, and copper. They are also a good source of other minerals including zinc and iron. After pumpkin carving, season the seeds with a little paprika, sea salt and cayenne pepper. Then place them on a baking sheet and roast at 450 degrees for 15-20 minutes (or until desired texture is reached). Pumpkin seeds are an excellent source of healthy fats, protein and fiber. A 1/4th cup serving provides 9 grams of protein! Instead of nuts, use these in trail mix or throw them in salads for a nice crunch! Let THIS Holiday Season be different. Rather than allowing sugar to take center stage, I challenge you to embrace the goodness of Pumpkin in its natural form. Sure, add some things to spruce it up, but only to highlight its natural flavors. I can’t give pumpkin recipes without providing the classic pumpkin bread option. With the suggested alternatives, this can be made gluten and dairy free! Instead of large amounts of oil or butter, this recipe uses pureed pumpkin and yogurt to yield a nice, moist loaf. Leftovers will stay fresh if stored in an airtight container (or tightly wrapped in plastic wrap) and refrigerated for at least 5 days. Preheat the oven to 350°F, and coat a 9×5” loaf pan with nonstick cooking spray. Hummus is a great healthy snack when paired with fresh cut veggies. Instead of traditional garbanzo beans and tahini, this recipe utilizes pumpkin seeds and Cannellini beans! Give this a try as an alternative to the standard hummus. It’s a great way to switch up the nutrients your body gets and to add a bit of excitement to your afternoon snack! Preheat oven to 350 degrees. Grease baking sheet or line with aluminum foil. Right on the pan add the the pumpkin seeds (pepitas), 1 tablespoon olive oil, 1/2 teaspoon smoked paprika, 1/2 teaspoon chili powder, salt and pepper. Toss well with your hands. Add the garlic cloves to one side of the pan (leave them in their skin). Roast for about 15-25 minutes or until seeds are cooked and begin to lightly brown. Remove the pan every 10 minutes to stir the seeds and check for doneness. Remove from the oven, let cool 5 minutes and then peel the skin away from the garlic. If the the garlic is not tender and fragrant when the seeds are done roasting, wrap them in foil and continue to roast until soft and roasted. Add the pumpkin seeds to a food processor and process until a smooth paste forms, scrap down the sides as needed. This took about 5 minutes. Once the pumpkin seeds form a paste, add the beans and garlic. Pulse and blend until combined and the beans begin to puree, about 2-3 minutes. With the processor still going, stream in olive oil, blending continuously for a few minutes (and scraping down the sides if needed) until as smooth as desired. Add the remaining, 1/2 teaspoon of chili powder and smoked paprika. Blend until combined add some salt + pepper and taste, adding more if desired. Add hummus to a bowl and drizzle with extra olive oil. Start dippin! Cut your pumpkin in half or into fourths and reserve the pumpkin seeds for later. Place the pumpkin on a baking sheet and rub the pumpkin with 1 tablespoon olive oil and sprinkle with salt and pepper. Chop off the top portion of the garlic head to reveal cloves. Peel any excess paper/skin off from the bulb of garlic. Pour about a teaspoon of olive oil on top the garlic cloves and cover with foil. Roast both the pumpkin and garlic together on the same baking sheet for 45 minutes, or until the pumpkin is fork tender and the garlic golden brown and soft. Remove from the oven and allow everything to cool five minutes. Squeeze garlic out of the paper skin into a small bowl and mash well with a fork, set aside. Grab the pumpkin and add it to a food processor (or mash extremely well) and puree with 1 cup of the chicken broth, puree until completely smooth. Heat a large pot over medium heat and add the butter and shallots. Saute the the shallots until soft, about 5 minutes. Add the thyme and cook another 30 seconds. Add the pumpkin puree, remaining chicken, coconut milk, water, cayenne, nutmeg, maple syrup and crushed red pepper. Bring the soup to a low simmer and simmer 15-20 minutes. While the soup cooks make the pesto. Add the roasted garlic, parsley, sage and pistachios to the bowl of a food processor. Pulse until finely chopped and then stream in the olive oil. Add the cheese and pulse a few more time until combined. Season with salt and pepper. To fry the pumpkin seeds. Add the reserved pumpkin seeds to a bowl and toss with 1 tablespoon coconut milk and 1 tablespoon flour. In a small bowl combine the chipotle chili powder, pepper and brown sugar. Place a skillet on the stove top and set to medium heat, add the olive oil. Once the oil is hot, add the pumpkin seeds into the pan, but be careful! Stir the pumpkin seeds around in the skillet with a spoon or spatula continuously until they expand and start to brown. Once the seeds are browned remove from the skillet and place on a paper towel to drain. Toss with the chili powder and a good pinch of salt. Taste and season accordingly. To assemble the soup, ladle the soup into bowls (or your roasted pumpkins) and top each bowl with a dollop of pesto, a sprinkle of pumpkin seeds and if desired drizzle with coconut milk. Start slurpin! To make the roasted pumpkin soup bowls. Remove the tops of the pumpkin and scoop out the seeds. Rub the insides of the pumpkins with olive oil, salt and pepper. Place on a baking sheet and bake for 20-30 minutes or just until soft to touch but not falling in. Pancakes?! Yes, please!! This paleo-friendly recipe satisfied that craving for a hearty, comforting breakfast, but without the sugar/carb crash. This recipe uses fiber-filled pumpkin puree and gluten-free, protein-rich almond flour to keep you satisfied through the morning. Feel free to add some turkey sausage or a few scrambled eggs for extra protein. In a small bowl beat the egg. Add in pumpkin puree and mix well. Add in the almond flour and mix until all ingredients are combined. Heat a nonstick skillet over medium-high heat. Lightly grease the skillet with a small amount (about 1/4 tsp) of coconut oil. Spoon 1 tablespoon of the batter onto skillet fro each pancakes. Cook until surface of pancakes have some bubbles and sides of the pancake firm up, about 2 minutes. Carefully flip the pancakes with a spatula, and cook the underside, for another 45 seconds. Transfer the pancakes to a warm platter and set aside. To make the caramel, in a small cat iron or heavy bottom skillet place all the ingredients except walnuts. Bring the mixture to a boil over medium heat, stirring frequently. Once boiling, turn the heat to low and let the mixture boil slowly for the next 3-4 minutes or until caramel has reduced and thickened. Add in the walnuts and mix well. Drizzle the caramel sauce over the pancakes and serve. If you are making a bigger batch of caramel, cooking time will be longer. Be mindful as you navigate the grocery stores and/or local coffee shops, as pumpkin is likely to be present in a not-so-healthy manner. Instead, utilize these recipes or toss some pureed pumpkin into your oatmeal or smoothie for seasonal-flavor that will also boost your health.